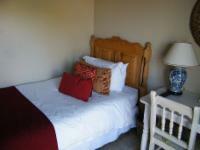 Each room is luxuriously furnished and exudes chic style with a country feel. 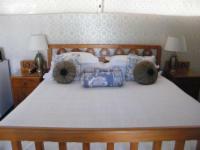 The guest house comprises six double rooms, each with either twin or queen-size beds and en-suite bathrooms. The Family Room consists of two adjoining rooms which comprise a queen-size and twin beds respectively; the rooms share a full bathroom. The last room has a single three-quarter bed with an en-suite shower bathroom. All rooms enjoy complimentary tea and coffee-making facilities, towels, fully stocked bar fridges, Wi-Fi access, ceiling fans and TVs with DStv access. The central location of Princes Lodge is ideally suited for your next board meeting, conference or staff training. The conference room can comfortably seat 30 people in cinema style, or 14 people around the boardroom table. Catering can be arranged according to our customer’s requirements, from gourmet biscuits and muffins through to finger foods or sit down meals served in our dining room. Princes Lodge also offers an intimate setting for small weddings, private parties and special occasions. East London locals pride themselves on the city’s natural beauty, breathtaking rivers, beaches and luscious indigenous vegetation. The city offers a world of activities from vibrant nightclubs through to a variety of excellent accommodation, fine dining, endless beaches as well as diverse sporting facilities. Wedding Venues: Princes Lodge also offers an intimate setting for small weddings, private parties and special occasions. Conference Venues: The conference room can comfortably seat 30 people in cinema style, or 14 people around the boardroom table. The service was top notch. Ncumisa went out of her way to accommodate all my special request. She was very friendly & helpful. It could help though if a buzzer (bell) is installed by the gate especially for the safety of guests arriving at night. Princes Lodge is 2.9km from the centre of East London , the nearest airport 10.5km (East London Airport).